Publication: April 14th 2014 by Entangled: Bliss. Country veterinarian Celia Gamble is in trouble. A misunderstanding from her past is rearing its ugly head and the only person she can turn to is Jonah Clarke—her family’s lawyer and, as it turns out, her brother’s best friend and her childhood crush. She always wanted Jonah to see her as a bona fide woman, but as a woman who’s being blackmailed for seducing a married man? Not on her life. I have always loved the song (Kissed You) Good Night by Gloriana. I love the passion in it. Well the song actually happens in this book and I loved it! We have Celia Gamble who has returned home after finishing vet school to practice at home. She has equipment set up and a place above it to live in. But after her brother died, she struggled in school and met a man who helped her. That man had an interest in Celia and she in him. But, turns out he’s married. OOPS! She stopped that really quickly once she found out. But his wife had other plans and that included blackmail and Celia didn’t know what to do, she did not want to tell her family. So she has no choice but to get help from Jonah, Celia’s crush growing up, and her brother Zach’s best friend. Jonah sees that Celia is all grown up. And maybe he notices a little too much because where Celia is concerned it is hands off. Celia’s brothers made Jonah an honorary brother to protect Celia. Sparks are flying everywhere between the two. Celia still wants him. Jonah wants her but can’t give in or Zach will cut him off from the family. Celia has been sheltered all her life with her brothers around and she is tired of it. So, when she gets a makeover from Des before Des and Zach’s wedding, she feels more empowered and decides to go after Jonah. Who cares what Zach says!! But with the crazy wife of her unfortunate affair and Jonah’s conscious, and Zach’s brotherly overkill, it isn’t easy for them. Everyone in town sees the attraction between the two. They just need to acknowledge it themselves! The chemistry is off the charts with these two. I love that in this book it seems that Celia is the more take charge girl instead of the guy going after the girl. I loved watching her transform throughout the book. I love small town and family stories. I love the ranch. I loved the ending. SO SO CUTE! Never saw that coming! 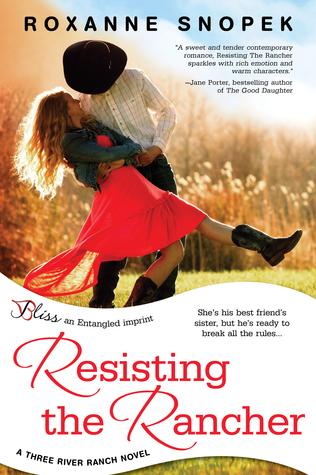 If you like families, watching people transform and grow, a sweet love story, a story with a crazy woman, ranches, horses, silly t shirts, animals, sweet kisses, lingerie, lawyers, and going after what you want than this is the book for you! Also, below is the video of Gloriana's song and just the song if you don't want to have a preconceived notion of the characters in the book. Now she explores all kinds of careers from the safety of her desk, through her characters. It's better for everyone that way. *It was 15 years ago, people! It's not like they died because of her!